Twice Baked Potato Casserole & Unclogging Pipes. When I saw a recipe that combined these two delicious creations, I had to try it. On Friday, I had a couple friends over and I used them as my guinea pigs for this recipe that I found on Six Sisters' Stuff blog, though it originates from a different blog. I didn't even think to take pictures while we were preparing it, because about 10 minutes into the prep process we had a hiccup - I told my friend to put the potato peels down the garbage disposal (bad decision) and like you'd guess, we clogged the pipes! THIS I had time to film! You're welcome! On the bright side, I learned that it's not real complicated to open up your pipes and get whatever is clogging it - out! Just make sure you have a big tub or bucket underneath for the water when it comes flowing out. Now, hopefully the clogging hasn't grossed you out completely, because the actual casserole was DELICIOUS! But again, no progress pics. Only the picture of the final product AFTER we'd devoured most of it. I can't use the Mike Meter on this one because he didn't get a chance to try any, but my mom did stop by Saturday and I gave her some to take home. She told me it was delicious! And she rated it a 10! So, there ya go. Everyone loved the Twice Baked Potato Casserole! at 11:53 AM 0 Comments Topics: Adventures., Blog., Handy Tips., Recipes. I consider myself pretty handy with a screwdriver and a nut. I know my way around a tool box and I like to fix things. 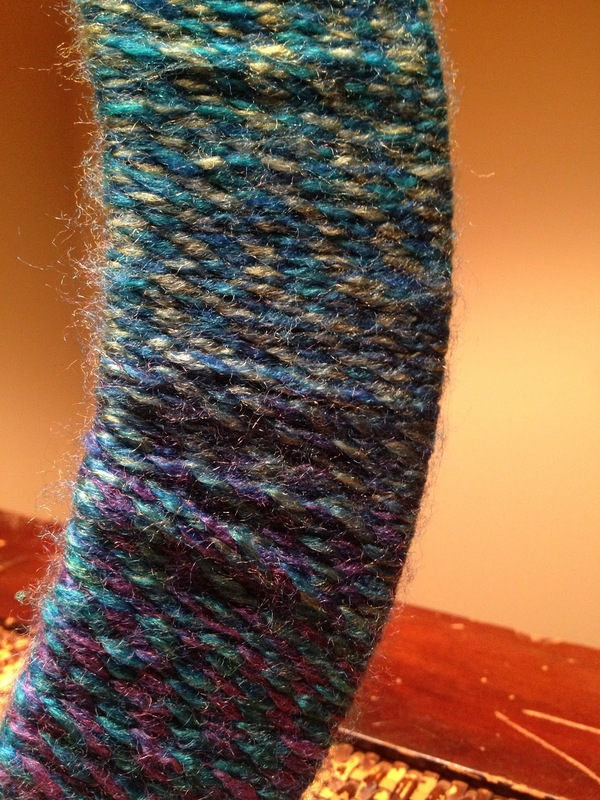 I like reading instructions and I like feeling the accomplishment after a project is finished! In the new home I've done my fair share of tool-related projects. So far, I've installed blinds. I read the instructions for the first window, but by the end I was a pro and did a second window without them! The screws that come with the kit strip so quickly! And I'm here to say that the rubber band trick really DOES work. 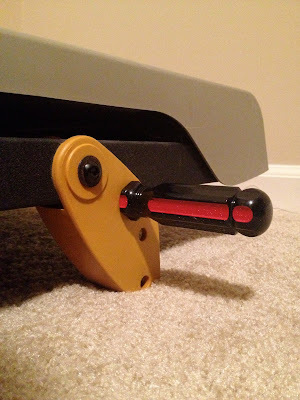 It helped me removed a stripped screw six times a couple times. I've also successfully rigged my $100 bargain treadmill so I'm not forced to walk at a 45' incline. Okay 45 might be an exaggeration, but it felt like that until I realized I was missing pins to lift the legs. Until I get pins from the hardware store, my hillbilly pins screwdriver will work just fine. See: hillbilly rigged bathroom curtain. Also, our "new" desk is constructed from 2 file cabinets and a $5 door from the Habitat Restore. More on that later... have I mentioned how much I love projects? at 12:10 PM 0 Comments Topics: Blog., DIY., Handy Tips. If you have not heard of Wine & Canvas yet, listen up! I recently had the opportunity to attend a private party at a friend's house organized by our local Wine & Canvas. 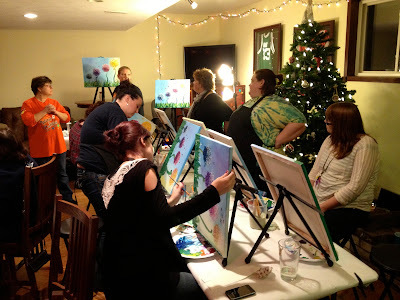 What it is... a painting party where you drink. WIN WIN! They are held all throughout our region and I know they're all over. You can go to www.wineandcanvas.com to see if there is one near you. 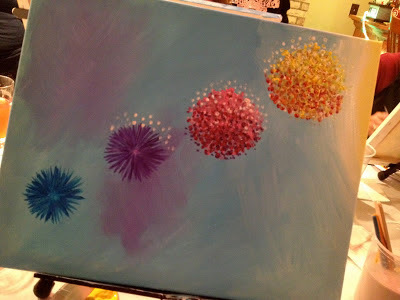 The painting my friend chose to do at her party was Dandelion Circus. I showed up, grabbed a drink, and was given paints, brushes and a blank canvas. Beginners to experienced painters alike can enjoy it! The instructor tells you what color and where to paint. And if the stars align, your painting ends up looking prettttty good! We started with coloring our background and creating "bursts." Then we added grass and started the dandelion stems. Finally, we added extra flyaways and put on finishing touches. 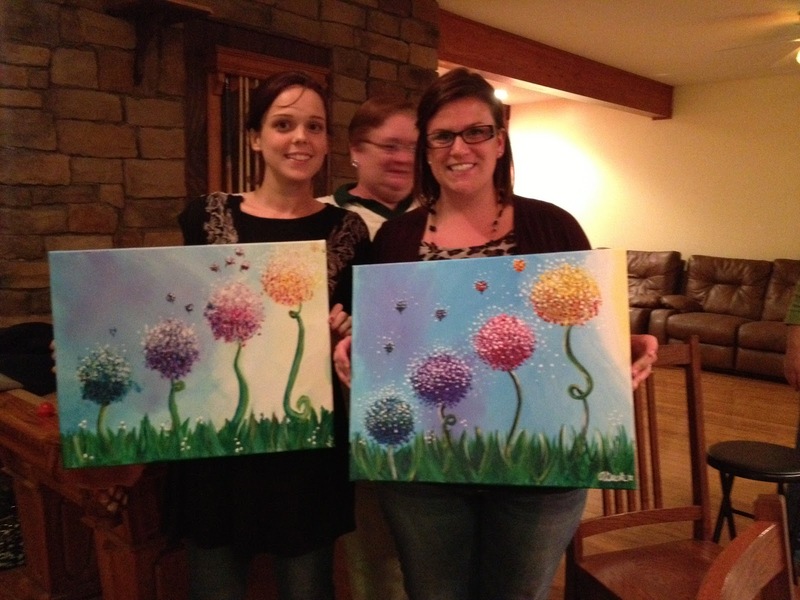 It was fun seeing all the other party goers and how everyone's painting turned out differently. 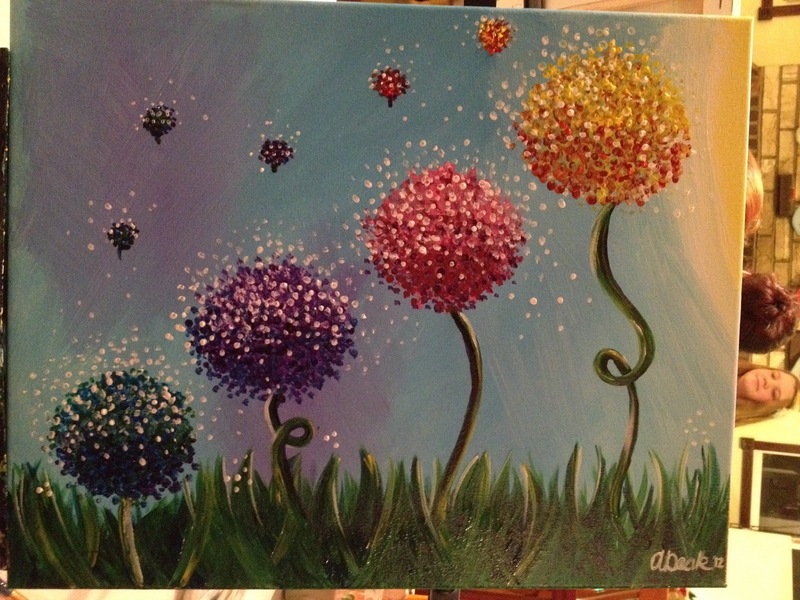 I had so much fun and I plan to check the calendar often to try and get to another paint night! 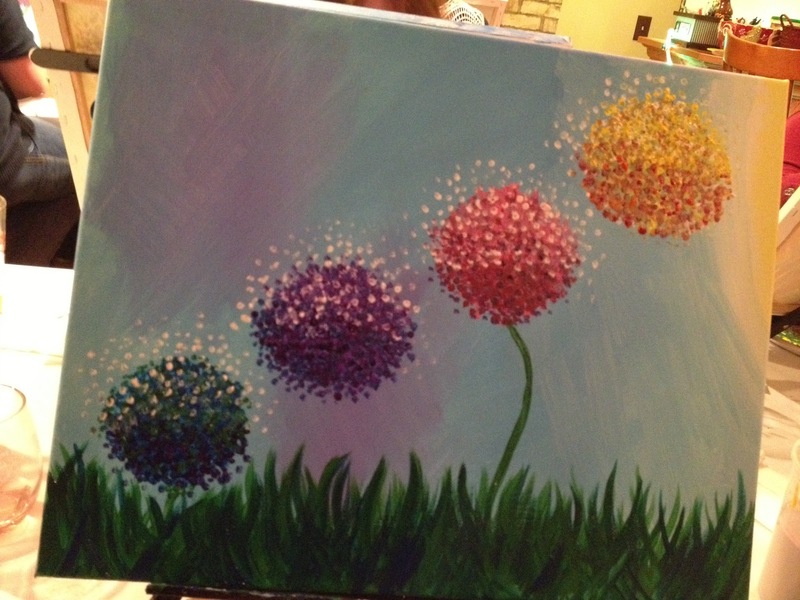 I'd encourage you to find a Wine & Canvas in your area and grab some friends! at 12:27 PM 2 Comments Topics: Blog., Crafts., Design., DIY. I'm in my late 20s. Crap, when I say it like that, I feel especially old.... Doesn't matter. The point is I have had a lot of friends get married the past few years and I've attended a ton of weddings. It's just that season in my life. That and the baby mania. And I love seeing my friends find love. I'm happy that I'm one of those lucky people and in 2011 I also got married. 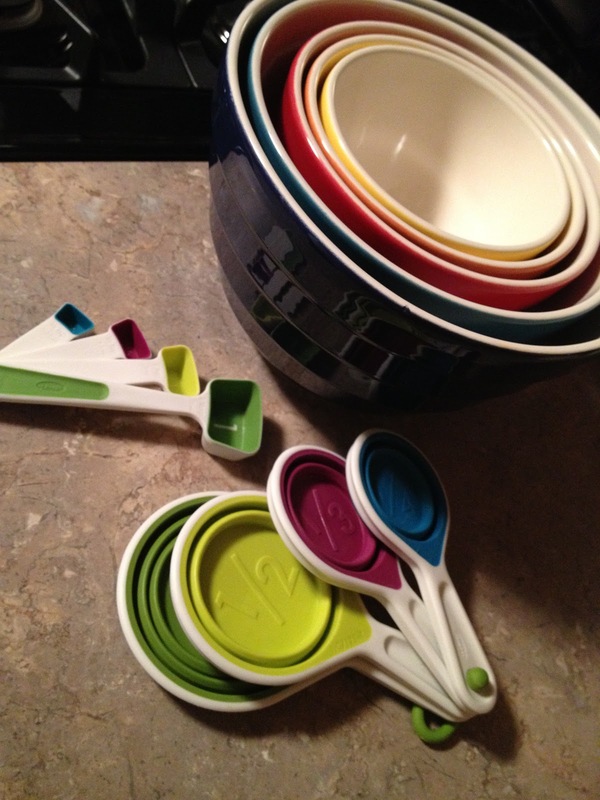 A friend of mine recently asked me what our favorite wedding gifts were that we received. To be honest, I loved almost all the gifts we received, but my favorites were the ones that I could tell people put a lot of thought into as well as the ones that were so practical that we've probably used them daily or weekly. I've come up with my favorites (which I already sent to my friend who asked) and will share them with you, too! I've probably forgotten some, too. But you won't know it if I did! First up... my return address stamp! 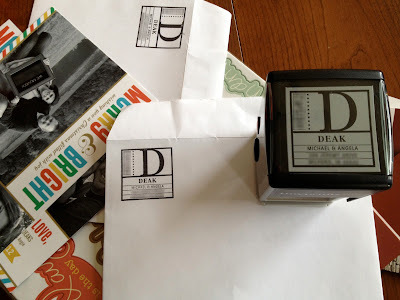 My friend Kelly got us a gift certificate that we used on the Three Designing Women website to pick out which stamp we wanted. I really liked this idea! It's something we use constantly and especially at Christmas time when we send out Christmas cards. Since we moved, I needed a new one with a new address. I got on the TDW site which directed me to other sites that carry their stampers, I ordered a new design and voila, it was in my mailbox! 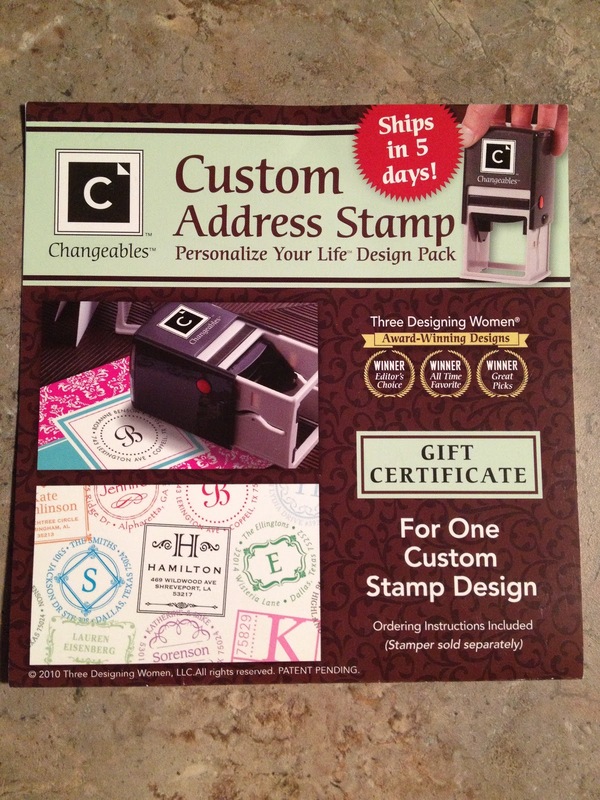 I think the stamp is so much more classy than return address label stickers! 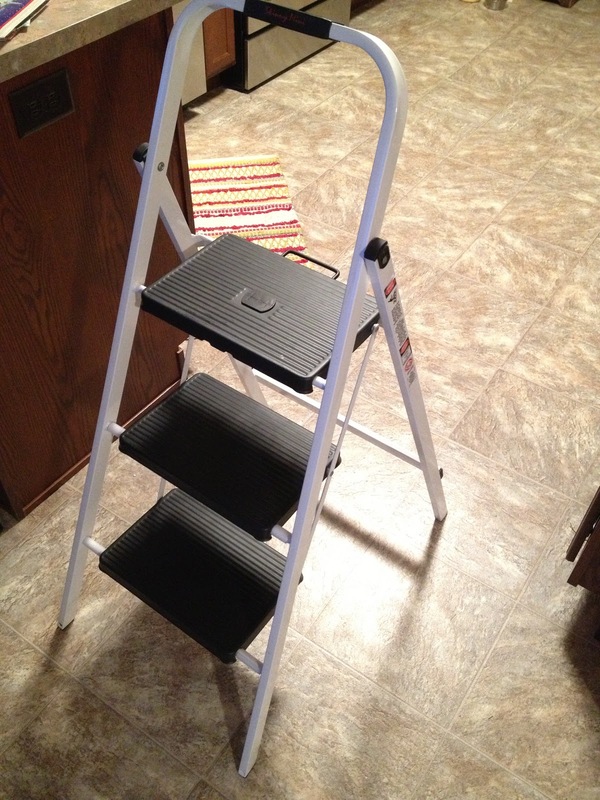 Next up is our step stool. My hubby and I are both pretty short and this thing is SO handy! We keep it in our closet and it gets used every few days. We did actually register for this at Menards, but the fact that our friends got it for us was great! And the thing that gets used EVERY.SINGLE.DAY. is our wall clock. Again, this was something we registered for at Bed, Bath & Beyond. 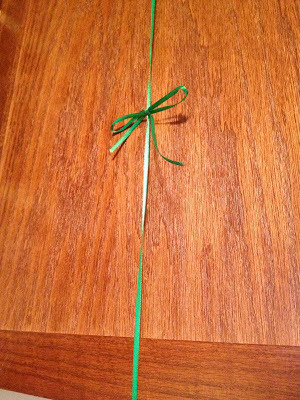 This was one of the last things to get "packed" when we moved from our old house and one of the first things to be unpacked in the new house. 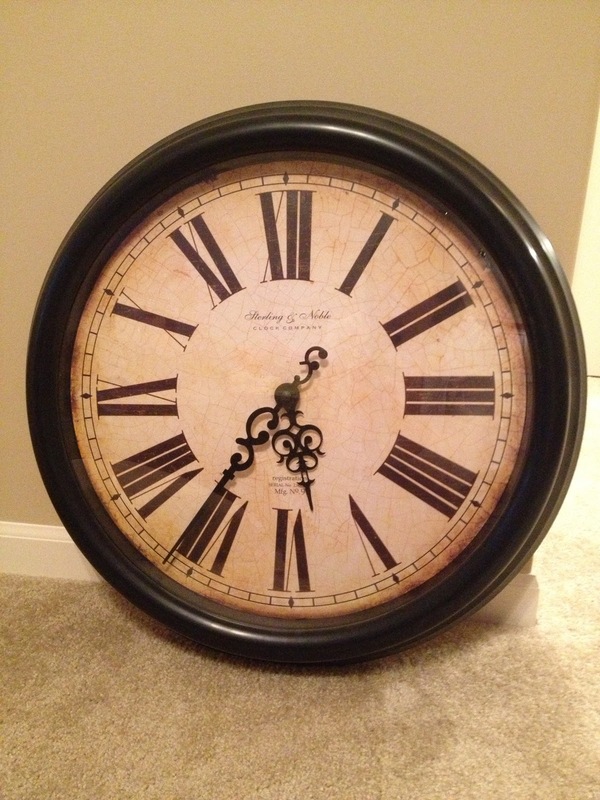 Since it's a clock, obviously it gets used all the time, but I think it's beautiful and I love how big it is. I still need to hang it on the wall, but I'm waiting until we paint the living room wall to do that. This is as far as I've gotten in the painting department. 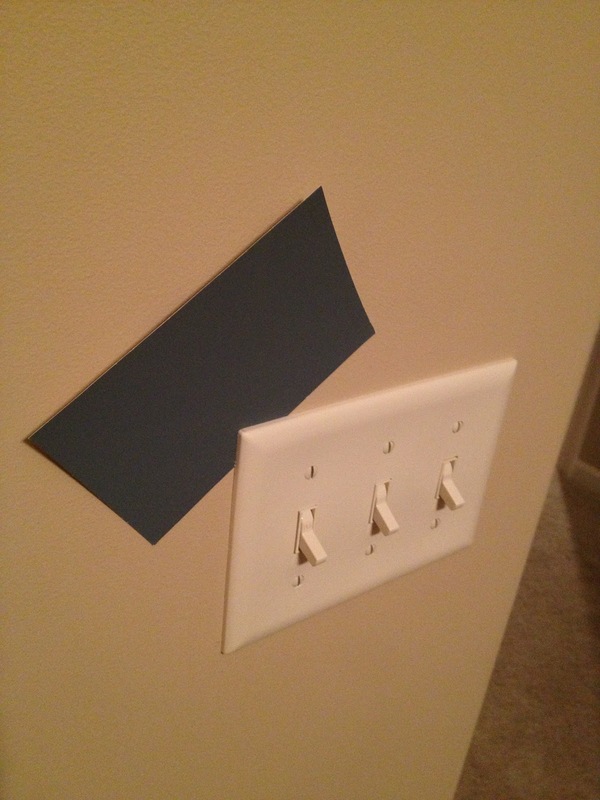 Picking out a color. It's hard to tell in this picture, but it's a gray/blue. The swatch just sits here, taunting me until I bite the bullet and buy a gallon of paint! at 11:58 AM 3 Comments Topics: Blog., Handy Tips. Happy New Year everyone! I realize I'm about a week late, but with my Christmas post being late, I figured I'd keep with pattern and do this one late, too! As I mentioned, my husband and I sold our house! Over the holidays we were living with family because the timing of moving out of our old house and into our new house didn't quite match up according to OUR plan. But in hindsight, we were fine. My aunt and uncle took us in for a few weeks and we are forever grateful for them. 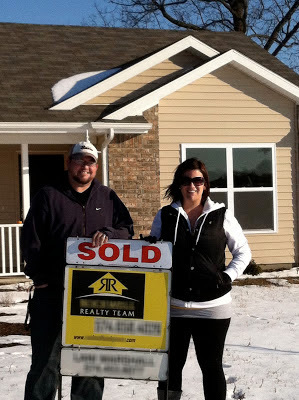 And when the day came to sign the papers on our new house, we were more than ready!! Now that we're FINALLY in our new house, I've already started some projects that I've put on a list dating back to about a year ago (I was a little antsy, eh?). 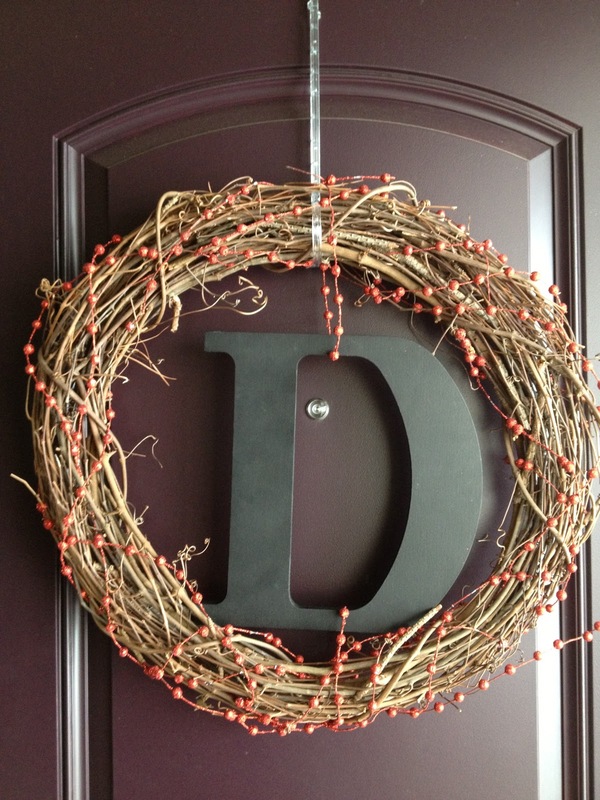 I couldn't wait to get my wreath on our new front door! I made it for under $20. 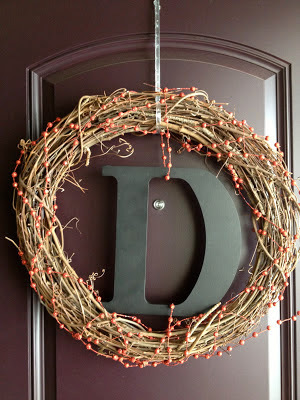 I bought the wreath hook, grape vine wreath, red berries and black "D" from Hobby Lobby. All the items were on sale, so it was a cheap craft! My plan is to rotate this wreath as the seasons change. 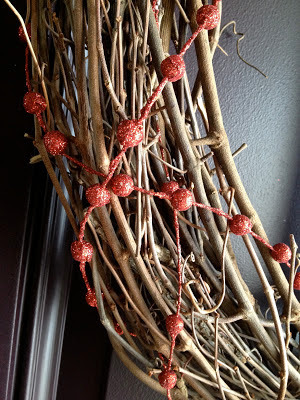 For now, I think it's a great winter wreath. Also, while at Hobby Lobby, I found a smaller "D" in the raw wood section. 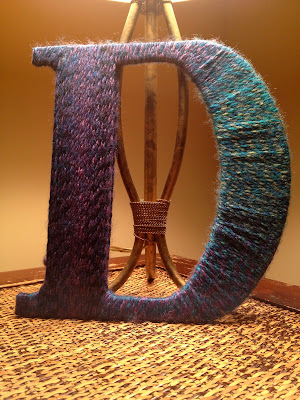 I keep seeing posts on Pinterest for wrapping these letters in yarn. Well, it just so happened that at our White Elephant family gift exchange, my dear hubby took home a box of multi-colored yarn. You know, just what he's been wanting...err, what his WIFE has been wanting! I got right to work on that baby! It was more complicated than I thought it would be with the D being a closed letter, but I eventually figured it out. I like how it turned out. Right now, it's sitting in our spare bathroom until I find a permanent home for it. Since we weren't at our own home over Christmas, the friends' and family's sweet cards got thrown into a folder until we could display them. Literally within 3 days of moving in, I had this assembled on my cabinet. I really wanted to be able to see all my loved ones' Christmas cards! 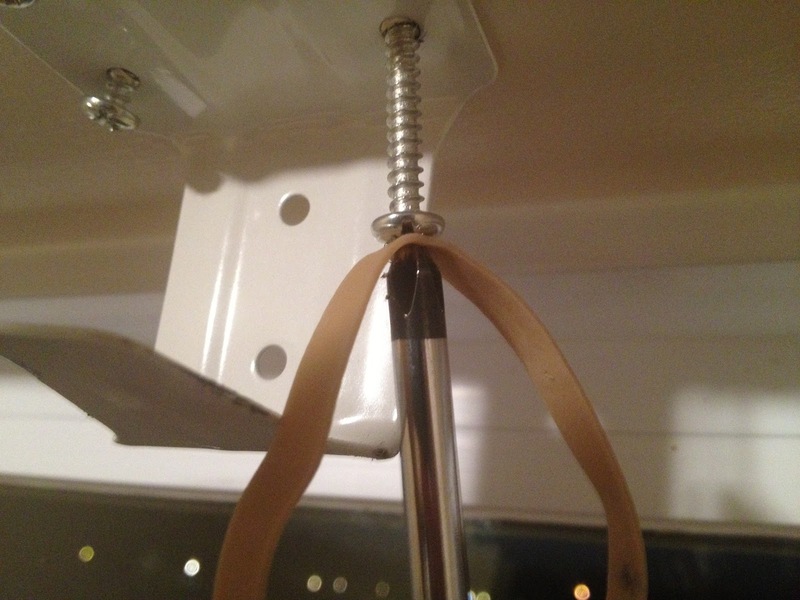 It's so simple to put together, and it frees up the refrigerator doors. 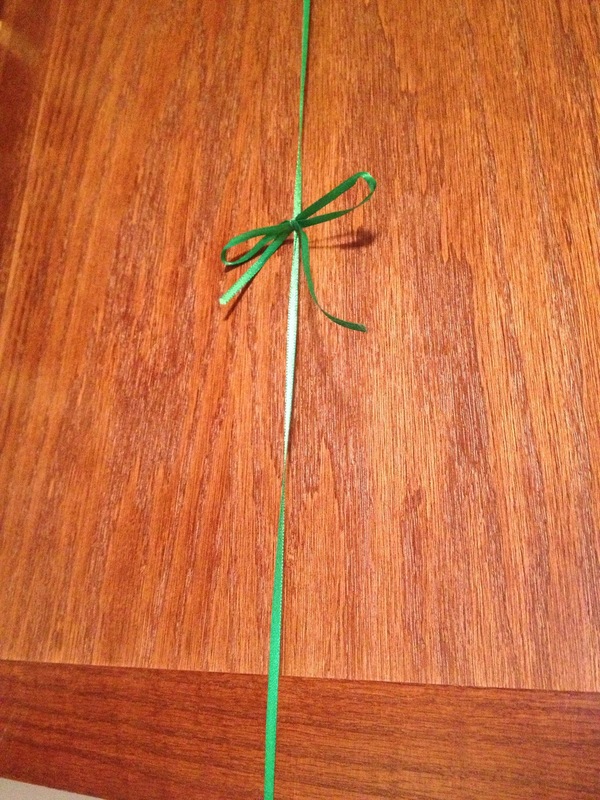 It's important to note, the string or ribbon you use should be pretty tightly tied. 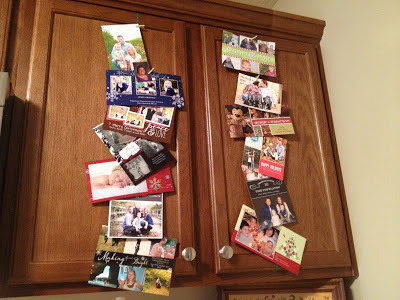 If it's too lose, the photos will slide down and just hang at the bottom of your cabinet. As I do more projects around the house, you bet I'll be posting more. I know there is no stopping me. Afterall, I have a Pinterest board named "New Home" and that's just the tip of the iceberg! at 11:19 AM 0 Comments Topics: Blog., Crafts., DIY., House For Sale.